I was surprised and delighted when five Beck films were picked up by the BBC and broadcast recently on BBC4. The first film I watched was enjoyable and entertaining but it seemed to miss the most important element of the famous series of books – the critique of Swedish society. However, I’ve watched four more and these new films have now definitely won me over. Martin Beck is important as arguably the first protagonist of what has for the last seven or eight years become known as ‘Nordic Noir’ in the UK and elsewhere. (I’m sure it has been called something slightly different in Scandinavia for several years.) The ten novels by the team of Maj Sjöwall and Per Wahlöö (living together as a couple) were written between 1965 and 1975. All ten novels were adapted for the cinema, some outside Sweden. (I discuss Bo Widerberg’s 1976 Beck film The Man On the Roof here.) The earliest film adaptations featured different actors playing Martin Beck but a series of six Swedish-German films in 1993-4 all featured Gösta Ekman as Beck. The current sets of films began in 1997 and (like the later Wallander films) are new stories using the central characters. Per Wahlöö died in 1975 and Maj Sjövall has not to my knowledge written any more Beck stories, so the 30 films since 1997 all use new stories. The importance of the original 10 novels was that the writers, Marxists both, attempted to offer a critique of Swedish society. This meant a level of realism in the police procedural and a level of political awareness and moral commitment by Beck himself. This in turn inspired later writers such as Henning Mankell (who wrote an introduction for the most recent UK translation of the first Beck novel Roseanna first published in 1965). And it was this element that I thought was missing in the first of the films broadcast by BBC4. I realise now that this was the last film of ‘Series 4’ from 2009. In Sweden the 90 minute films have tended to go straight to DVD with only occasional theatrical releases, though I believe the more recent films have appeared first on TV in Sweden. The four later BBC4 screenings are of the 2015 films from Series 5. Beck is played (as in all 30 films) by Peter Haber, a veteran Swedish actor in TV and film, best known outside the country perhaps for the original Girl With the Dragon Tattoo in which he played Martin Vanger. Haber is perfectly cast as Beck, embodying the character introduced in Roseanna all those years ago. The others in the team have been ‘updated’ and Beck now leads a team of five. His right-hand man is Gunvald Larsson (Mikael Persbrandt), almost the polar opposite of Beck but also complementary – someone decisive, cool under pressure but perhaps too quick to act, even if he is often shown to be correct. The two officers who do most of the leg-work are Oscar and Jenny and at the start of the fifth series, a new member is introduced in the form of Ayda, a young ‘civilian’ brought in as a research and IT expert. Ayda might be seen as the indicator of the influence of the recent explosion of female investigators in Scandinavian crime fiction. Her character’s name (Ayda Çetin) suggests that she is from a Turkish migrant background. She speaks several languages and is clearly adept in both IT skills and police/intelligence procedures. When they first meet there is a potential clash with Gunvald (because Ayda is not a police officer) which Beck quickly attempts to avert. The script seems to be pointing towards a future narrative involving Gunvald and Ayda. In the third film of Series 5, Oscar is developed as a character partly through the coincidence that his wife is in the final stages of pregnancy at the same time as one of the characters in the case the team is investigating. Oscar is being teased, especially by Gunvald. He is a ‘new man’ in many ways and perhaps he is a little naive but he is a reliable and competent police officer. All this comes into focus when Jenny is asked about what it is like to work on the team. She then gives her own analysis of what might happen when Beck retires and each of the others ‘moves up’ a place. She seems quite happy that she will then be third out of four and a new member will be the junior. I realised at this point that I had become much more aware of the individual characters in the team and I was getting much more out of the show. The stories too seemed to be developing much more in line with how the novels had originally worked out. I should also mention that another new character in Series 5 is the new head of the whole police operation. This is Klas Fredén and he seems a familiar character from procedurals anywhere. He’s much younger than Beck and very managerial with arrogance and a ‘touchy-feely’ manner. Significantly he is immediately shown to be completely wrong in over-ruling Gunvald – again perhaps foreshadowing future developments. Martin Beck is a wonderful character who is gentle and understanding but still an efficient cop who doggedly sticks to his task and solves crimes through hard work rather than flashes of genius. The critique is not direct but the crimes are contextualised in terms of recognisable human behaviour and not something fantastical. I’d very much like to see more of the thirty films please BBC4. In the meantime the arrival of The Bridge 3 is eagerly awaited. Nordic Noir TV films are discussed in Chapter 9 of The Global Film Book. Sen refers to his film as a ‘murder mystery’ but I’m not sure that is the most useful descriptor of its possible categories/genres. It’s certainly ‘crime fiction’ and a ‘police procedural’ which explores the classic trope of the loner police officer seemingly up against not just the bad guys, but also the local community and his own police colleagues. The setting is an outback town in Western Queensland, a town with a significant indigenous Australian community. Jay Swan is himself an indigenous Australian (I’ll use ‘Aboriginal’ from here in since that’s the term Sen himself uses in the Press Pack) who has gone to the city to become a detective. He has returned to his home town and a spacious house on the ‘right’ side of town. His ex-wife and teenage daughter are still living on the ‘estate’ on the ‘wrong’ side. The crime fiction is flavoured like the recent Nordic variety with an exploration of the social issues of the outback communities. Mystery Road is a Cowboy Western film, and that evolved through determining the look and the attitude of the lead character. Aaron [Pedersen] was always going to be the lead in the film . . . and Ivan wanted Aaron looking like a cowboy. He wears a cowboy hat, he slings a pistol and he’s wearing cowboy boots. Once that was established the film itself became a Western. Having these clear signals means that there is none of the confusion (for me at least) found in Ivan Sen’s previous film Toomelah (2011). On that film, Sen worked with non-professionals and because he didn’t want a full crew to intimidate them he performed all the production roles himself. By necessity, this gave the film with its hand-held camerawork a rough look. Mystery Road by contrast gives Sen the cinematographer a full supporting crew (and the budget to include several aerial sequences) as well as a cast stuffed with Australian stars of film and television – including a cameo appearance by the veteran star of 1970s Australian cinema, Jack Thompson. They all do an excellent job. The Western and procedural tropes are well-used. Jay’s role as the detective refers to the figure of the Aboriginal ‘tracker’ in earlier Australian generic narratives – often used ‘against’ his own people. This kind of ‘turncoat’ character also turns up in American Westerns with the Native American tracker or, more recently, the Native American detective (e.g. in Thunderheart (1992)). Further parallels can be found in African-American police procedurals such as Charles Burnett’s The Glass Shield (1994). The clearest Western references are in the iconography of hat and boots, the glorious landscape shots and in the almost intimate scenes between characters, shot in close-up, in bars, interrogation rooms and over fences. True to his intentions, Sen allows dialogue and camerawork to make the narrative ‘sing’ – though there are also sound effects like the howling of the wild dogs (real or imagined). Sen’s ear for dialogue remains occasionally weak and largely humourless. Even as he tries admirably to create scenes charged with a constant—perhaps too constant—sense of elusive, cryptic menace, he undercuts the effect with clanger exposition lines like, “But then, your old man was the head stockman around here for ages,” when a rancher comments on Swan’s eye for horse flesh. The narrative point here is that we need to know various things about Jay’s background. Some of them we can pick up easily from what we see – Jay doesn’t drink alcohol for instance. This is re-inforced by a comment his ex-wife makes suggesting he used to drink heavily. The knowledge about Jay’s father could have been given via a photograph perhaps, but the dialogue exchange is quite subtle I think. The rancher is a racist who is quietly goading Jay, here pointing out that he knows exactly who Jay is – and implicitly pointing to a local hierarchy. Later in the exchange Jay will ask the rancher how much land he has – in order to point out that he has much to leave to his children whereas the locals like Jay’s father have little to leave to their children (except the Winchester rifle, a heavily significant bequest by Jay’s father to his son). I loved these quiet but menacing exchanges, but perhaps that’s just a personal taste. Audiences across the world have learned how to read Westerns and American film noirs but these Australian outback narratives require cultural knowledge that is difficult to pick up except from similar films. Sometimes it’s the white Australians who seem the most mysterious. There is a sequence in Mystery Road in which Jay goes out to meet an old man who had filed a report about wild dogs near Mystery Road. These eight minutes with Jack Thompson don’t seem to have any direct bearing on the crime narrative (and the wild dogs are similarly not fully ‘explained’). Perhaps the Thompson cameo is just a character study that fills in the background? I was reminded of the eccentric figures who inhabit the wonderful Wake in Fright (Australia 1971) re-released in the UK in the last year. There is a tendency amongst critics to want to separate genre from ‘arthouse’ so that the lacunae of the latter should not ‘spoil’ the purity of the former. Personally, I like my genre films to have layers and to present puzzles that can’t be resolved in just a single viewing. Mystery Road is going to be worth seeing a second time and possibly a third. Thoroughly recommended, the film (from the small distributor Axiom) is only likely to stay briefly in cinemas where the big screen brings out the best from the cinematography – so see it now if you can. Here’s a trailer but note that the music isn’t there in the film itself and the trailer over-emphasises the action. But it does give a good idea of the landscape! This is the first adaptation of the crime novel series from Jussi Adler-Olsen. It’s a classy production written by Nikolaj Arcel, photographed by Eric Kress and starring Nikolaj Lie Kaas and Sonja Richter. (Richter and Kaas were leads in Open Hearts (2002).) Director Mikkel Nørgaard is making the transition to features after several TV series including Borgen. Everything works as it should but there is something lacking for me. Several commentators have suggested that the film looks like the first episode of a TV series. I can see this argument and it stands up when you consider that both of the series of Wallander adaptations included feature-length episodes that were released in cinemas. Perhaps if this had been a primarily Swedish rather than Danish production that is what would have happened here. But what do I know? This film adaptation was the major homegrown box-office winner in Denmark in 2013 and a second film adaptation is already in the works. The crime narrative category here is the ‘cold case procedural’, which has already produced successful TV series in the UK and US. Adler-Olsen’s central character is Carl Mørck, a highly-respected and successful detective in Copenhagen who makes a wrong decision on a job and is ‘punished’/’hidden’ by his superior by being put in charge of ‘Department Q’ buried in the basement of police headquarters. The boss expects him to just file reports on cold cases but of course Carl starts to investigate them. 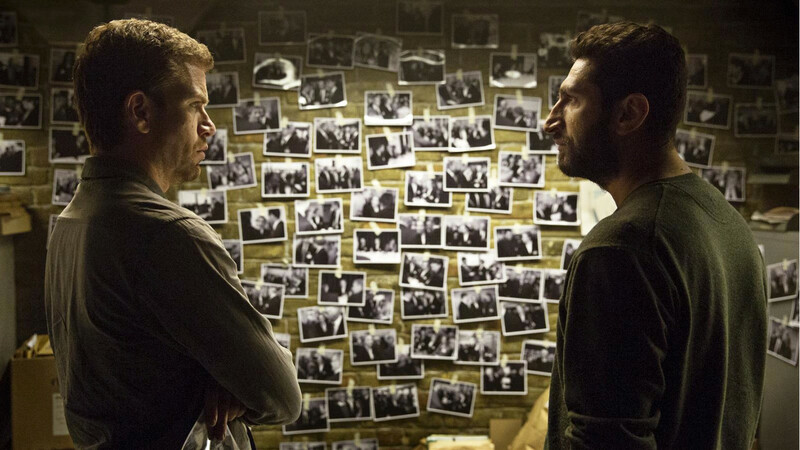 He is assisted by Assad, played by the experienced Lebanese-Swedish actor Fares Fares. This is the character that gives the novels their unique flavour. Carl is sullen and resentful and never smiles but Assad is hard-working, sensible, pain-staking, conscientious etc. – but also cheerful and quite comic. The ‘banter’ between the two is engaging and, for me, is the saving grace of the novels. Some of the comedy comes from Assad’s less than perfect grasp of Danish and the cultural differences between the two. A more typical image of the stygian gloom of Department Q and the familiar wall of photos associated with the investigation. The cold case here involves a junior politician from the Democrat party in the Danish parliament. She disappears on a ferry trip when she is travelling with her brother who has a disability which affects his social skills. The police report is perfunctory and the assumption is that the woman committed suicide by jumping into the sea. What follows is an investigation that uncovers a story that is frankly not that unfamiliar if you’ve watched/read a reasonable amount of Nordic crime fiction over the last few years. (Some plot points are similar to those in Killing 3 and The Bridge 2.) Through a series of flashbacks that are intercut into the procedural we soon get to realise what is going to happen to Sonja Richter as the missing woman – and eventually why it is all happening now. This is certainly ‘Nordic noir‘ in the sense that it is very dark, both in its look and in the theme – yes, this is another narrative in which a man does unspeakable things to a woman. But this time there isn’t an avenging female investigator (the books have been compared to Stieg Larsson). The other feature of ‘Nordic noir’ is the focus on a social issue/critique. Or at least it is in the Swedish instance. The Danish stories seem slightly different but in the only novel I’ve read from this series the theme does include a critique of inequality. It also seems to have more complex plotting than Keeper of Lost Causes. I will watch the second film when it is released as it promises a more critical edge in discussing the Danish middle classes. I’m also interested in how the filmmakers develop Assad’s character (and the possibility of a third, female, member of the team). Chapter 4 of The Global Film Book includes a case study on ‘Nordic Cinema’. I was interested in the second of the six films based on the novels of Maria Lang made for Swedish TV channel TV4. The films are being broadcast by BBC4 in its Saturday night slot reserved mainly for European crime dramas. The first of the six last week was generally panned by the UK press. I confess that I didn’t get to the end. I found the first film very easy on the eye – a summer-house on an island near Stockholm in the 1950s – but the plotting of an Agatha Christie-style whodunnit was a tad tedious. I did however like the three central characters who are the focus for the whole set of films. I therefore approached the second film with my hopes still raised. According to Wikipedia the first film was released in cinemas but subsequent releases went straight to DVD. I noticed immediately that the second film was presented in 16:9 whereas the first had been in CinemaScope (2.35:1). Fortunately the reduction in aspect ratio wasn’t followed by a reduction in narrative scope, I found this episode more interesting. The idea behind the six films is to present the central trio with crimes that are all ‘close to home’ – i.e. their social settings all involve the trio. The stars of the show are Tuva Novotny (Puck), Ola Rapace (Krister) and Linus Wahlgren (Eje). Puck is a doctoral student of literature. The first film opened with a lecture she gave on Zola’s Thérèse Raquin. Eje and Krister are both from a fictitious small town in Central Sweden called ‘Skoga’ – created by Maria Lang and based on her own small town Nora. Eje, a history academic is Puck’s fiancé and Krister is a Stockholm police Inspector. The basic premise of the stories is that Puck becomes Krister’s amateur assistant rather like Miss Marple. The second film, ‘King of Lily of the Valley’ is set in Skoga with Krister and Eje invited to a wedding. It is also getting close to the time of Puck and Eje’s own wedding and she is with him. The Skoga bride never makes it to the altar and Krister and Puck set out to find her murderer. The press notes issued by the production company quote Maria Lang as aiming for “escapist entertainment with a problem to be solved. The tone is ‘light’ with some almost absurdist comedy and this is more important than heavy and serious social realism.” This has lead some UK commentators to compare the films to Midsummer Murders (very popular in Denmark, but I don’t know about Sweden?). I can see the connection, but it is important to remember that these stories were written in the 1950s, i.e. the period of Agatha Christie’s later Miss Marple stories. However, Puck is a very ‘modern’ figure, a proto-feminist in many ways. At the end of the second film she and Eje discuss what they want in marriage and she asserts that she isn’t sure that she wants children and that her career is very important to her. Eje, to his credit, seems genuinely to support her. Researching the actors I noted that Tuva Novotny was the titular character in Slim Susie (Smala Sussie, Sweden 2003), an absurdist ‘crime comedy’ set in Central Sweden and a big local hit. I’m also reminded of Masjävlar (Dalecarlians, Sweden/Denmark 2004) also set in small town Central Sweden with some humour in an otherwise dark family melodrama and a young woman at its centre. I mention these links simply because there are several Swedish references in the films that refer to literature, rural cultures etc. that aren’t immediately apparent to UK TV audiences. The title of the second film refers to a poem by Gustaf Frödings, a nationally renowned poet from Värmland in Central Sweden. Skoga/Nora is by the looks of it a ‘heritage town’ with beautifully preserved residential houses and ‘quaint’ streets of shops etc. and the 1950s setting is easily evoked. The first two films have been beautifully shot in summer settings and there is an obvious fascination in the clothes, hair styles etc. Mad Men meets Miss Marple is an obvious shorthand for what we see. I will watch the other four films mainly because of the three central characters and especially Ms Nuvotny who is not a conventional beauty but is still disarmingly attractive. I think it’s worth noting too that compared to Agatha Christie there is much more overt sexual action in these films as well as a sense of humour. Maria Lang must have been an interesting writer in her day. This series is a useful example of ‘Global Television’ as discussed in Chapter 9 and of Nordic Cinema as discussed in Chapter 4 of The Global Film Book. Bradford International Film Festival (BIFF) has organised a short retrospective of the work of the Japanese director Nomura Yoshitaro, put together by Festival Director Tom Vincent with the co-operation of Nomura’s studio Shochiku. Five films have played in Bradford and they will also go to the ICA in London for screenings between 18 April and 23 April. Before the first screening Alexander Jacoby, author of A Critical Handbook of Japanese Film Directors: From the Silent Era to the Present Day, gave us some ideas about how to place Nomura as a Japanese director. Nomura Yoshitaro (1919-2005) is barely known in the West, although some of his films were released in the US by Shochiku. In Japan however he was greatly admired and Alex told us that in the Kinema Jumpo ratings (from the most authoritative Japanese cinema journal) Nomura’s films were often placed higher than those of Kurosawa and other directors well-known to Western fans of Japanese cinema. Why didn’t this success lead to exports? Alex suggested two possible reasons. First, Nomura was unfortunate in that he did not become fully established as a ‘name’ director until the late 1950s/early 1960s. The Japanese ‘masters’ – Kurosawa, Mizoguchi, Ichikawa, Naruse and Ozu began to see their films exported via film festivals and art house releases from the early 1950s and therefore Nomura missed the boat. By the early 1960s the Japanese New Wave headed by Oshima Nagisa was starting to make noises and Nomura was then too ‘old-fashioned’. Second, Nomura was seen primarily as a ‘genre director’. 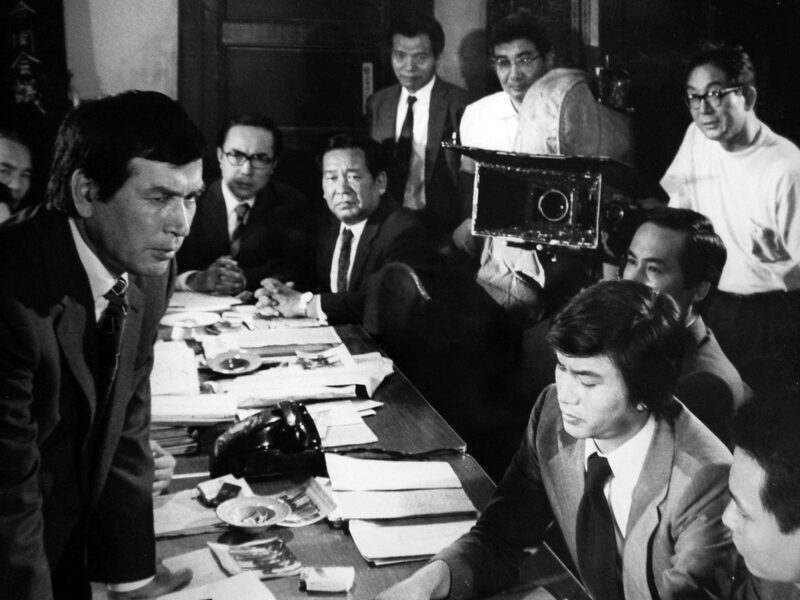 He made films in many different genres but the films on show in Bradford are all based on stories by the very successful writer Matsumoto Seicho and mix crime fiction and melodrama. Alex suggested that actually Nomura was a director with ‘personal vision’ and that perhaps he worked in the same way as Howard Hawks. I’m not sure whether Hawks is the director I’d pick out but within any studio system there are bound to be directors capable of producing a genre film with the something extra that makes them recognisable as ‘personal’. Nomura intended his films to be for the popular market but as soon as he was able to get more substantial budgets (his early films were low-budget programme-fillers in the early 1950s) he prepared carefully for his productions, especially in organising location shooting for Matsumoto’s stories which often featured scenes in different parts of Japan (and frequent train trips). Chaiki Omori from Shochiku’s international department helped to introduce the films and she emphasised that as far as possible Nomura tried to create the precise conditions for each locations described in the story. He would turn off the air-conditioning and make his actors really sweat if the story demanded it, he would shoot at noon if the script said it was noon etc. The problems with making the distinction between an ‘auteur’ and a ‘genre director’ are immediately apparent when comparing Kurosawa Akira’s adaptation of an Evan Hunter crime novel in High and Low (1963) with Nomura’s policier/melodrama Stakeout (1958). All the critical praise for the former should be matched by that for the latter (my review to follow). There are differences between Kurosawa’s approach with its attention to historical/social details and references to other filmmaking and literary cultures and Nomura’s more directly Japanese focus but both directors are interested in the characters as much if not more than in the genre narrative. I think that Nomura’s films could have worked overseas and the Bradford season offers a useful opportunity to test out this theory. I’ve just caught an episode of Endeavour, ITV’s Inspector Morse prequel series. It’s a very impressive production with an excellent leading pair of Shaun Evans as the young Morse and Roger Allam as DI Thursday. Tonight’s episode was set in January 1966 with generally very good production design but thankfully not a soundtrack packed with pop songs. The musical references, appropriately for Morse, were mainly classical but there were two good live performances of r&b/blues in a nightclub. Barrington Pheloung’s music was always an important ingredient of the original series. My interest here is to raise questions about genre and the global market for crime fiction TV. Inspector Morse (Carlton/ITV 1987-2000) was in many ways an influential TV export, not least because of its relatively large budget (arguably more than for domestic UK cinema features on an hourly basis). The most obvious reference for Endeavour in terms of period setting and narrative potential is the BBC series Inspector George Gently which began in 2007 with Martin Shaw in the lead. I was struck tonight by the central narrative thread which was shared by Inspectors Thursday and Gently as tough London cops who have had to leave London to work in Oxford and Tyneside respectively, but who are now facing up to the past they thought they had left behind. The London underworld, property development and town planning corruption as seen in the Endeavour episode are very much authentic 1960s crime narrative material. Endeavour scores because of the single-minded moral strength of the young Morse, very different to the unpleasant reactionary values of young Sergeant Bacchus in George Gently. I like George Gently but I do wonder if it doesn’t draw a little too much on the nostalgia repertoire of Heartbeat and its spin-off The Royal which filled ITV’s early evening Sunday slot. These were comic cop and doc dramas set in North Yorkshire in the 1960s, which fed voraciously on 60s nostalgia for cars, pop songs and other aspects of popular culture (I say this from only the very briefest of glimpses of long-running series and I’m happy to be corrected). A slightly closer reference for George Gently and Endeavour might be Jericho with Robert Lindsay as Inspector Michael Jericho – a high-budget Granada series broadcast in 2005 and set in London in the 1950s. This was seen as linked to the success of ITV’s Foyle’s War with Michael Kitchen as a police inspector working in London during 1939-45. That series has recently returned, reportedly because of public demand and has moved into the immediate post-war period. Soon another new ITV ‘mini-series’ (2 x 1 hour) Murder on the Home Front will be broadcast dealing with the Home Office pathologist and his secretary investigating a series of murders in London in 1940. I think we have here a quite distinctive crime genre repertoire covering crime fictions with ‘personal’ stories (i.e. interesting characters with back stories?) 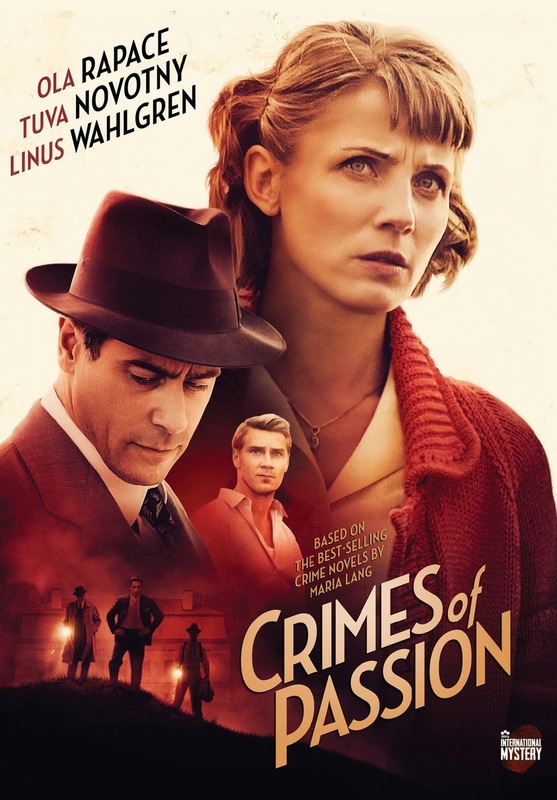 set in the 1940s-60s and drawing on crimes of the period in social/cultural/political terms. On the other hand, a much broader repertoire of ‘crime fiction mixed with costume drama’ could be seen to include a very large number of UK crime fiction production on TV over the years. The original Sherlock Holmes and more recently Ripper Street, Agatha Christie’s Poirot and other stories are all effectively period drama, but not treated in the same way as this current trend. These earlier series feel more like attempts just to use a colourful backdrop rather than to explore something about the time period in question. Endeavour (the mysterious first name of the Morse character, if you weren’t aware) feels like the most ‘serious’ of these historical crime fictions, perhaps because of the personality of the central character. Some of the others exploit the comic potential much more and in the case of the BBC hits Life On Mars (2006-7) and Ashes to Ashes (2008-10) the comedy is partly social satire and postmodern ‘play’ mixed with science fiction. These two theories also dealt with the slightly more recent past of the 1970s and 1980s. I guess I have two questions for others interested in TV crime fiction in a global context. First, is this a peculiarly UK genre? I remember as a child watching the US series The Untouchables (1959-63) and there has been a more recent Canadian series of Murdoch Mysteries (2008-) but neither of these seem quite the same as Endeavour/Gently/Jericho etc. I’m hopeful of Young Montalbano which I think we’ll get in the UK later this year? Do you agree that there is a distinctive new genre repertoire? If so, how do you think we should begin analysing it? I thought I’d spotted most of the major Nordic crime writers but there always seem to be more. Arne Dahl is the ‘crime fiction pseudonym’ of Swedish writer Jan Arnald. It looks like a kind of anagram but it makes me think of Arlene Dahl (a B picture contract star at MGM in the 1940s/50s). Arne Dahl has written around ten crime novels about a team of elite police officers known as the ‘A Group’. The first of these has been translated into English as The Blinded Man and was published by Vintage in 2012. The first five novels were each adapted for television as 3 hour films, presumably shown in two parts. That’s how BBC4 have decided to show them in the UK in their favoured Nordic Noir slot on a Saturday night. Part 1 of The Blinded Man was screened under its Swedish title Misterioso – the title of a Thelonious Monk track featured in the film. I suspect that many of the Killing/Bridge fans won’t like this as it is certainly not a procedural/melodrama with a careful script. I worried that it might be a US type SWAT squad show but it looks more like Stieg Larsson territory with as much violence but possibly a little more humour. I was pleasantly surprised. In this opener we have a version of the Danish three-part structure. Someone is assassinating bankers (make your own wish here) while a bunch of Estonian gangsters is concerned about their operations in Sweden and the Stockholm police decide to put together an elite squad of misfits from all over Sweden to find the banker-killer. We even got the classic Dirty Dozen/Dirty Harry narrative device of a police officer who has done something dumb in catching a miscreant and is then whisked away to join the A Group – when he should be being disciplined. The rest of the A Group includes a short working class IT expert and a huge body builder type (who IMDB reports is played by a real one-time bodybuilder). The short guy is played by Matias Varela who currently has the highest profile with his work on the Easy Money franchise in Sweden. This large and short duo go out on a job and a suspect refers to them as Laurel and Hardy. A couple of the other funny scenes are quite deadpan and I was reminded of the work of Roy Andersson. This reference was strengthened by the use of music, jazz being important – but the camera and the fast editing were not at all like Andersson. I found that 90 minutes whizzed by and the show seemed quite fresh. Only one of the six in the A Group hasn’t been properly introduced to us yet, but already they seem like an interesting crew. I’m looking forward to next week’s second part.